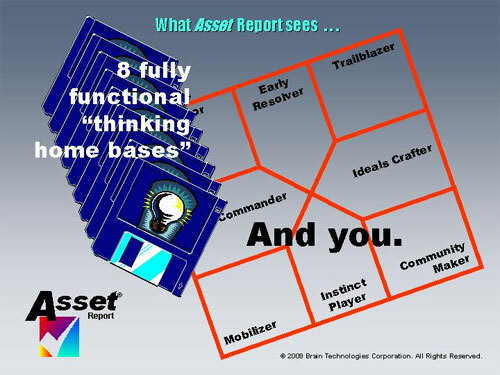 Business Thinking Skills Tool | Asset Report®: The Book of You! executive mind training tool, right now! Not even the creator of Asset Report®: The Book of You personal assessment tool—Dudley Lynch, co-founder of Brain Technologies—understood the full ramifications of (1) asking that question and (2) making room in a person’s tomorrows for the answer until he had worked on the task for years. He finally realized it would be necessary for clients of his “Book of You” self coaching process to go deeper and more prescriptively into their inner thinking ecology than they had ever gone before. That is why if you do opt to pursue the “real, total story” about you, you should expect to see yourself described—probably for the first time ever—in rich, astonishing specifics as a highly complex human. As a business and executive mind. Or as a uniquely personal mind. Or as both. They Quickly Disappear into Another Zone! President/CEO, Grey Matters International, Inc.
"As an executive coach for almost 30 years, I’ve been exposed to many——if not most——self-assessment tools. For many years you may think you’re alive and well——even successful. But every now and then, you can find yourself ending up in a state of burnout; in the trauma field we talk about 'secondary traumatic stress.' I had found that all attempts to change this cycle proved shallow. Then, last year I began to EARNESTLY work through my own Asset Report. It saved my life and changed my relationships for the better! As both a coach and a trauma practitioner, I can recommend this brilliant tool for coaching towards wholeness and wellness." So that you don’t think we are succumbing to nice if heart-felt encomiums about Asset Report, we’d like to introduce you to some of the reasons why we think the AR qualifies as a one-of-a-kind “change your brain” thinking and life skills development tool. It all starts with Asset Report’s remarkable online questionnaire. You simply check a few answers. But in that short time, everything you thought you knew about “personality profile” assessments gets turned on its head. Because the AR’s beguilingly simple questions are actually in the service of no less than five critical “thinkology” models. These sensitive tracking methodologies are there to avoid the mistake of so many assessment instrumentalities: focusing on the behavioral “tip of the iceberg” and ignoring the larger, wider, deeper inner picture of you and how you think. About What You Are Really Capable Of! Your Asset Report will indeed be a fully customized “Book of You” of more than 100 pages! It is not compiled by a computer (although certain algorithms do help bring order to the report’s complexity). Instead, Mr. Lynch creates each and every AR report personally and painstakingly from the 12,000-item database he spent more than four years researching, creating and perfecting. What It Means to Be One of Eight Kinds of Thinkers. Task Commander, Mobilizer, Instinct Player, Community Maker, Ideals Crafter, Trailblazer, Early Resolver or Evaluator. Knowing which of these primary perceptual and valuing lenses you wear is critical because you don’t see your business and personal worlds as they are, you see these worlds as you think they are! What It Means to “See” Others from Your Home Base—and Be Seen from Their Bases. Even if we were all from the same culture, all spoke the same language and were all the same gender or color, we would still have a huge diversity problem as executives, managers and employees and in all the other areas where we have contacts and relationships. The Psychological Games You Play. Some are the games you know best (because you’ve played them so often). Some are games you defend well against (because you aren’t easily hooked into playing a role in them). And some are games where you may be victimized or confused (because you don’t understand or recognize them). Asset Report wants you to be crystal-clear on the games your mind plays most. And understand the gains you may forfeit when it does. How Your Mind Sees Itself Leading—And How It Doesn’t. Your mind sees life as a complicated path with endless choices, the constant choosing of which can grow wearisome. Your “Book of You” will take much of the mystery and pain out of when, where and how you can expect your mind to create, lead and change. And how to improve the quality of the choices it makes when it selects new forks to travel. How Do You Get Your Mind to Say, “Now, There’s a Plan!”? The plan, of course, is to upgrade all your business and life thinking skills. Which familiar skills can you grow? And which unfamiliar skills will stretch your mind? Do you need to strengthen old values or engage new ones? Or some of both. What are little self coaching steps you can take? What are the blockbusters? Time and again, Asset Report will make the case for your being more as a personal, business and/or executive thinker, but each time, knowing you must make the call, it will guide you in doing just that! And all this requires that we must pay closer attention, adapt more rapidly, react faster and integrate information more skillfully than ever before. And certainly not a time to upgrade your computer every 18 months and forget about upgrading yourself. Rather this is a time when it has never been more important for you to be involved in an ongoing, across-the-board, good-results-producing program of personal “change your brain” thinking skills upgrade. It is, in fact, Asset Report’s ability to serve as the bedrock instrumentality for this kind of intense, top-to-bottom personal thinking skills upgrade that makes Brain Technologies’ remarkable tool so unlike anything else available for personal discovery and growth. Using Asset Report, you will discover truths that strike to the very heart and soul of who you are—truths about you that, to now, may have been out of sight and thus out of mind. Using Asset Report, you are going to be enthralled by the prospect of gaining new mastery of your current thinking gifts … and then venturing beyond them. Using Asset Report, you are going to thrill to see what you are already really capable of. Because the more we learn about life, the more we discover that life is all about learning. And the more we learn about ourselves, the more we discover that learning says everything about the quality of our living. If you are ready for the “real, total story” of who you are and how you think, Asset Report is ready to help you “climb your mind” to new heights and new vistas of perspective and opportunity. Believe it when we say that Asset Report is different than any assessment instrument you have ever encountered. And that it is capable of producing results that go beyond any “Brain Technologies” self-inquiry you’ve ever launched! Plan for Pushing the Envelope of Your Future. to Serious Personal Growth and Development. If you ask us to produce your fully personalized and customized Asset Report: The Book of You, it is likely to be one of the most substantial investments in a personal and business thinking skills growth tool that you have ever made (outside the costs of your formal education, of course). And this brings us to one, final, vitally important revolutionary way that Asset Report is unique in its approach to the question: Can you be different? You already know our answer to that: Yes, you can! Living things have been doing it since the beginning. But please, may we ask you something else? Why go looking for the other end of the rainbow when your very existence already places you at the golden end of your rainbow? Why worry about being different when there’s so much of you—so much that is exciting and worthwhile and, yes, marketable!—that hasn’t been adequately recognized and actualized? Why not work to apply your natural advantages and strengths before looking for new traits and skills to conquer? We believe Asset Report will cause you to view thinking fitness as seriously as cardiovascular fitness or any other fitness important to purposeful, aspiring, totally engaged individuals. We believe Asset Report will equip you to make better, quicker, fuller decisions than ever before on what you will stand tall for and what you won’t stand for at all. We believe Asset Report will, from the very first reading, cause you to begin describing yourself differently to people who can help you, and they in turn will begin to see you differently. We believe Asset Report will open your eyes to numerous thinking qualities and skills you possess that have simply been sitting on the shelf, unused. We believe Asset Report will quickly bring you a positive, proactive, life-changing new sense of what is possible for you, both as a business person and as an individual intent on being all you can be! To order your personal copy of Asset Report: The Book of You, click on the order button below. This is what will happen: (1) You’ll be ask for payment and shipping information (the cost of your fully personalized, totally customized 100-page-plus Asset Report** is $149; priority shipping (see below) is free in the United States, $8 in Canada and $15 to most other countries). (2) You will be directed to our online questionnaire. (3) When you have finished the questionnaire, click again and your answers will be e-mailed to Mr. Lynch. (4) Within 24 hours, he will personally handcraft your 100-plus-page Asset Report document, and it will be mailed to you immediately via Priority or Global Priority Mail or another appropriate and speedy means of delivery. Copyright 2015 Brain Technologies Corporation. within 30 days of purchase, no questions asked. P.O. Box 358655, Gainesville, FL 32635.